This glittering ball of stars is the globular cluster NGC 1898, which lies towards the center of the Large Magellanic Cloud—one of our closest cosmic neighbors. The Large Magellanic Cloud is a dwarf galaxy that hosts an extremely rich population of star clusters, making it an ideal laboratory for investigating star formation. Discovered in November 1834 by British astronomer John Herschel, NGC 1898 has been scrutinized numerous times by the NASA/ESA Hubble Space Telescope. Today we know that globular clusters belong to the oldest known objects in the Universe and that they are relics of the first epochs of galaxy formation. While we already have a pretty good picture on the globular clusters of the Milky Way—still with many unanswered questions—our studies on globular clusters in nearby dwarf galaxies just started. The observations of NGC 1898 will help to determine if their properties are similar to the ones found in the Milky Way, or if they have different features, due to being in a different cosmic environment. 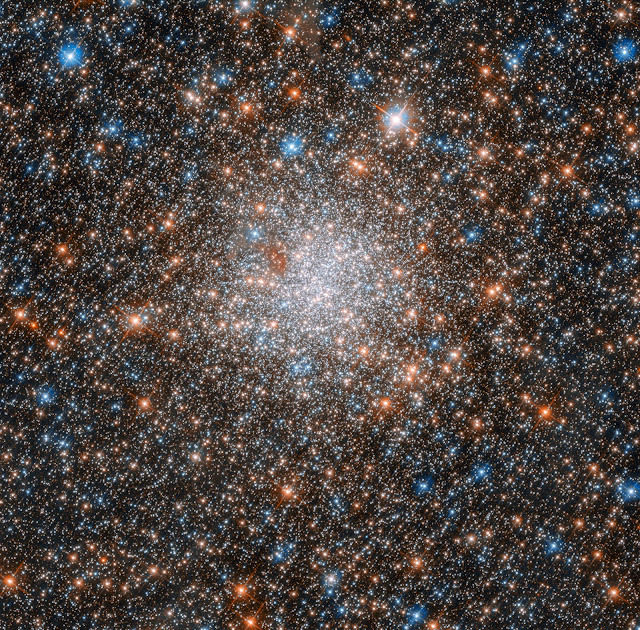 This image was taken by Hubble’s Advanced Camera for Surveys (ACS) and Wide Field Camera 3 (WFC3). The WFC3 observes light ranging from near-infrared to near-ultraviolet wavelengths, while the ACS explores the near-infrared to the ultraviolet. NASA's Space to Ground: "A Successful Failure"